In last week’s article, we talked about Henry Jacob “Doc” Faust, one of the most interesting individuals to take part in Tooele County’s portion of the Pony Express Trail. Faust was the station keeper at the Meadow Creek station that eventually took on his name. Faust’s station was located on Meadow Creek just north of where Vernon is today. The Sheeprock Mountains hem this area in on the south and wrap around to the northwest. 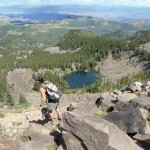 Outdoor recreation abounds in the Sheeprocks and there are several good canyons that will get you deep into the range, such as Harker and North Oak Brush canyons. The Sheeprocks are stunning when viewed from the Pony Express Trail in southern Rush Valley before ascending Lookout Pass. The range receives a lot of snow each winter from storms that blow in from the desert. The snow collects in deep drifts in the hollows of the leeward crest of the ridges. In spring, the high, treeless slopes of the Sheeprocks shelter these drifts after the snow has melted in other areas. With the green of spring and the blue sky, the Sheeprocks are beautiful. Not surprisingly, there are tiny cold streams and a few stands of fir and aspen. If you hike North Oak Brush Canyon, you can follow the old mining road to a sharp rock that sits in the bottom of the canyon standing over 100-feet tall among the trees. 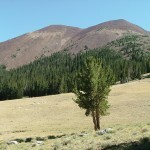 This is the “Sheeprock” from which the range derives its name. I like to imagine that Faust and others at Meadow Creek cut wood up in the canyons to build corrals, cabins and keep the fires and stoves burning in winter. Jabusch stated that the station stood on the elevated ground south of Faust Creek and the meadow that is now a boggy flat. This is probably where the name “Meadow Creek” came from. According to Jabusch, the 1860 census listed Faust, his wife Elise and their one-year-old baby George, as residents at the station. Theirs was a “Home Station,” which means it was better equipped, had numerous mounts, supplies and services that were not available at the lesser stations spread out between the home stations. The 1860 census also listed the following express riders as being associated with this station: George Wright, Hy Bilman, Howard Ransom Egan, William Fisher, George Farr and a Mr. Pinehart. There is an interesting story about William Fisher that I found in a family history writing by his son Ray H. Fisher M.D. who lived from 1883-1952. 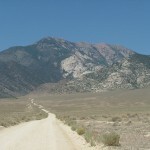 Fisher stated his father started from Faust Station in Rush Valley on his 75-mile leg to Salt Lake City. There was a terrible blizzard and William Fisher was told not to proceed, but he replied, “The mail has to get through.” Like other Pony Express riders mentioned last week, Fisher became lost in the white out for many hours. Frozen and fatigued, he sat down in the snow beside a cedar tree to shield him from the storm. He began to feel drowsy and just as he was about to fall asleep, a rabbit jumped across his lap and roused him. That mangy rabbit likely saved Fisher’s life as he reconstituted himself and moved on, arriving late but safe and sound in Salt Lake City after the storm broke. That same story is mentioned in Maj. Howard Egan’s “Pioneering the West” under the chapter title “Saved by a Rabbit.” I find it interesting to piece together puzzles of history that corroborate each other in this way. Doc Faust was not a full-fledged physician. He had studied medicine with the intent of becoming a surgeon but, as stated in last week’s article, left school due to ill health. He had a natural ability for the medical arts, however, and though he did not possess the proper credentials, he saved many lives and alleviated untold suffering. Faust also dealt with the American Indians in the area a great deal and became fluent in their language. He used his skill and medical knowledge for their benefit at every opportunity. You could fill a book with Faust’s adventures in the county’s West Desert as he was truly a remarkable man. Even at an old age in 1890, Faust, while visiting the Brighton area in the Wasatch Mountains, proposed the tiny chain of lakes there could be turned into reservoirs and supply Salt Lake Valley with water in times of drought. Today, Salt Lake City Corporation manages these reservoirs and they are the principle water supply for our capitol city. 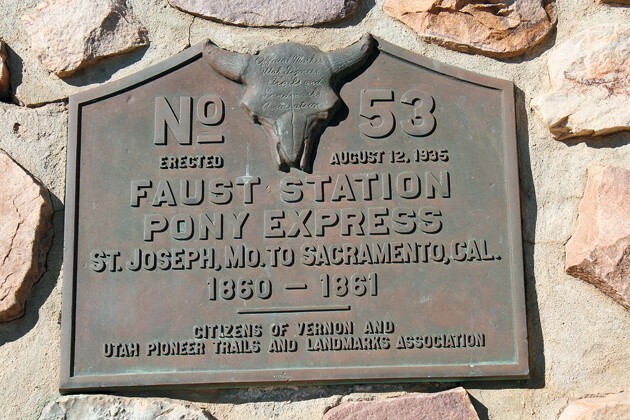 We will further mention Faust as we continue west on our desert exploration of the Pony Express Trail in the coming weeks. If you decide to travel on the trail across the West Desert this time of year, beware for it can be treacherous. I have the good fortune of working in the middle of the West Desert about 20 miles north of Simpson Springs, so I get to enjoy the desert views on a daily basis. The storms that have hit Tooele County over the last week or so have had a dramatic impact on the desert. Roads and ground that were once solid are now submerged or turned into an impassible muddy quagmire. Even so, someone with a good 4X4 vehicle and time on their hands could head out onto the Pony Express Trail. The reward would be stunning views. But just remember if you venture into the West Desert this time of year, all bets are off. Do not deviate from the main express trail because the desert valley roads are impassible. Similarly, travel slowly because if you slide off of the trail into the mud, you will be stuck for a long time. I can only imagine how miserable such conditions must have been for Pony Express riders as they likely had to dismount and walk their horses through the knee-deep muck. Yet, I also imagine that they must have taken a moment to appreciate the sublime beauty of the desert and mountains. For current road conditions, contact the Bureau of Land Management at 801-977-4300. 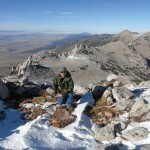 USGS 1:24,000 quad maps for areas mentioned in this article include: Faust; Vernon; Lookout Pass; Erickson Knoll and Dutch Peak.